For Acceleo v2.0 and launching of Acceleo Modules Farm, Obeo will release with an OpenSource license one of its commercial modules : UML2Hibernate. It will be available before the end of may. I hope you will enjoy it, and you will contribue to improve its features. thank you for you response, I've downloaded acceleo-2.5.0-sdk from http://www.acceleo.org/pages/download-acceleo-2-5-0/en, is that the right thing? is that the acceleo v2.5 contains umldi graphical editor? 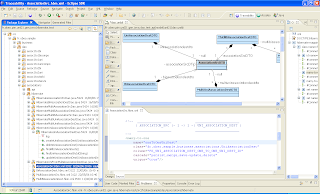 You can use any UML2 modeler you want (MagicDraw, RSM, Eclipse Papyrus, ...). But, you can use the ready to use bundle of Acceleo (go to http://acceleo.org/pages/download-bundle/), and we will have TopCased UML inside it to design UML models.